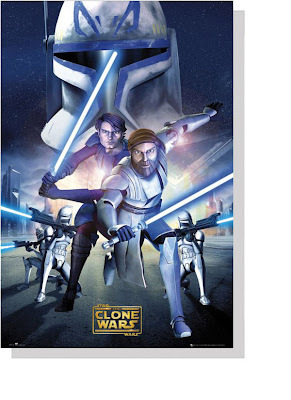 Two new posters for George Lucas' "Clone Wars" animated feature distributed by Warner Bros.(August) have been released. Lucas has moved the cgi backwards ten years..hope this is a one off. 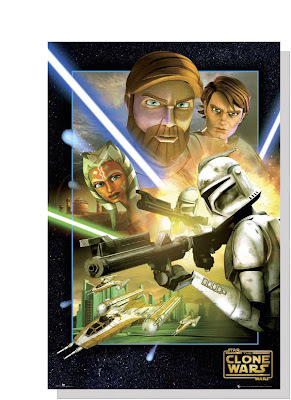 With the advent of the Clown Wars as a cartoon with graphics that rival most games on a PS2, I hereby give up on Lucas and Star Wars. No longer will I try to explain why Star Wars was an important movie to kids of the 1970s and 1980s. No longer will I try to explain my connection to the first trilogy. Lucas has turned this franchise into a pile of crap. When I saw the trailer, someone in the audience yelled, Make It Stop! Please, Make It Stoop! And everyone laughed. Bravo, Lucas! Bravo! What's next? The Old Republic starring finger puppets? Finger puppets? Now that's an idea! kind of hard to imagine which will be the worst movie of the summer--Clones or Meet Dave. Clones worse than Meet Dave? I don't even thing Lucas is capable of that!